In economics, a depression is a sustained, long-term downturn in economic activity in one or more economies. It is a more severe economic downturn than a recession, which is a slowdown in economic activity over the course of a normal business cycle. A depression is an unusual and extreme form of recession. Depressions are characterized by their length, by abnormally large increases in unemployment, falls in the availability of credit (often due to some form of banking or financial crisis), shrinking output as buyers dry up and suppliers cut back on production and investment, large number of bankruptcies including sovereign debt defaults, significantly reduced amounts of trade and commerce (especially international trade), as well as highly volatile relative currency value fluctuations (often due to currency devaluations). Price deflation, financial crises and bank failures are also common elements of a depression that do not normally occur during a recession. a recession lasting 2 or more years. There are also differences in the duration of depression across definitions. Some economists refer only to the period when economic activity is declining. The more common use, however, also encompasses the time until economic activity has returned close to normal levels. A recession is briefly defined as a period of declining economic activity spread across the economy (according to NBER). Under the first definition, each depression will always coincide with a recession, since the difference between a depression and a recession is the severity of the fall in economic activity. In other words, each depression is always a recession, sharing the same starting and ending dates and having the same duration. Under the second definition, depressions and recessions will always be distinct events however, having the same starting dates. This definition of depression implies that a recession and a depression will have different ending dates and thus distinct durations. Under this definition, the length of a depression will always be longer than that of the recession starting the same date. A useful example is the difference in the chronology of the Great Depression in the U.S. under the view of alternative definitions. Using the second definition of depression, most economists refer to the Great Depression, as the period between 1929 and 1941. On the other hand, using the first definition, the depression that started in August 1929 lasted until March 1933. Note that NBER, which publishes the recession (instead of depression) dates for the U.S. economy, has identified two recessions during that period. The first between August 1929 and March 1933 and the second starting in May 1937 and ending in June 1938. Today the term "depression" is most often associated with the Great Depression of the 1930s, but the term had been in use long before then. Indeed, an early major American economic crisis, the Panic of 1819, was described by then-president James Monroe as "a depression", and the economic crisis immediately preceding the 1930s depression, the Depression of 1920–21, was referred to as a "depression" by president Calvin Coolidge. However, in the 19th and early 20th centuries, financial crises were traditionally referred to as "panics", e.g., the 'major' Panic of 1907, and the 'minor' Panic of 1910–1911, though the 1929 crisis was more commonly called "The Crash", and the term "panic" has since fallen out of use. At the time of the Great Depression (of the 1930s), the phrase "The Great Depression" had already been used to refer to the period 1873–96 (in the United Kingdom), or more narrowly 1873–79 (in the United States), which has since been renamed the Long Depression. Common use of the phrase "The Great Depression" for the 1930s crisis is most frequently attributed to British economist Lionel Robbins, whose 1934 book The Great Depression is credited with 'formalizing' the phrase, though US president Herbert Hoover is widely credited with having 'popularized' the term/phrase, informally referring to the downturn as a "depression", with such uses as "Economic depression cannot be cured by legislative action or executive pronouncement", (December 1930, Message to Congress) and "I need not recount to you that the world is passing through a great depression" (1931). Give any country's households one-million dollars each (perfect equality), and sixty years later you will find gross inequality - consistently. This is how successful capitalism is designed to work and monetary systems require governance or rebalancing as they mature (see Mature Capitalism, to ensure cost-of-living and incomes stay in balance as is needed to support a minimum Social Contract. In history, these cycles, and their associated debt corrections, are recorded thirty-times. The Torah and Bible (Leviticus 25:26) document them in circa 760 BCE, as does the Code of Hammurabi in 1763 BCE. Due to the lack of an agreed definition and the strong negative associations, the characterization of any period as a "depression" is contentious. 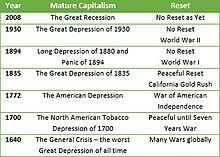 The term was frequently used for regional crises from the early 19th century until the 1930s, and for the more widespread crises of the 1870s and 1930s, but economic crises since 1945 have generally been referred to as "recessions", with the 1970s global crisis referred to as "stagflation", but not a depression. The only two eras commonly referred to at the current time as "depressions" are the 1870s and 1930s. To some degree this is simply a stylistic change, similar to the decline in the use of "panic" to refer to financial crises, but it does also reflect that the economic cycle – both in the United States and in most OECD countries – though not in all – has been more moderate since 1945. There have been many periods of prolonged economic underperformance in particular countries/regions since 1945, detailed below, but terming these as "depressions" is controversial. The current economic cycle, which has comprised the most significant global crisis since the Great Depression, has at times been termed a depression, but this terminology is not widely used, with the episode instead being referred to by other terms, such as the "Great Recession". The largest Great Depression of all time occurred during the General Crisis. The Ming Province of China went bankrupt, the nation of Poland ceased to exist, and the Stuart Monarchy was in civil war on three fronts in Ireland, Scotland, and England. Thomas Hobbes, a University of Edinburgh Professor, created the first recorded explanation of the need for a universal Social Contract in his 1652 book Leviathon based on the general misery within society during this period. This depression is acknowledged to be a worse Great Depression than the later Great Depression of the 1930s. This great depression was ended in the United States by the California Gold Rush and its' ten-times addition to America's Gold Reserves. As with most great depressions, it was followed by a thirty-year period of boom economy in the United States, that we now call the Second Industrial Revolution (of the 1850s). The Panic of 1837 was an American financial crisis, built on a speculative real estate market. The bubble burst on May 10, 1837 in New York City, when every bank stopped payment in gold and silver coinage. The Panic was followed by a five-year depression, with the failure of banks and record high unemployment levels. Starting with the adoption of the gold standard in Britain and the United States, the Long Depression (1873–1896) was indeed longer than what is now referred to as the Great Depression, but shallower. However, it was known as "the Great Depression" until the 1930s. The Great Depression of the 1930s affected most national economies in the world. This depression is generally considered to have begun with the Wall Street Crash of 1929, and the crisis quickly spread to other national economies. Between 1929 and 1933, the gross national product of the United States decreased by 33% while the rate of unemployment increased to 25% (with industrial unemployment alone rising to approximately 35% – U.S. employment was still over 25% agricultural). A long-term effect of the Great Depression was the departure of every major currency from the gold standard, although the initial impetus for this was World War II (see Bretton Woods Accord). In any case, the world economy has simply outgrown the capacity of additions to the world gold supply to accommodate the increase in world population and increased trade without periodic, painful revaluations of any currencies tied to gold. Beginning in 2009, Greece sank into a recession that, after two years, became a depression. The country saw an almost 20% drop in economic output, and unemployment soared to near 25%. Greece's high amounts of sovereign debt precipitated the crisis, and the poor performance of its economy since the introduction of severe austerity measures has slowed the entire eurozone's recovery. Greece's continuing troubles have led to discussions about its departure from the eurozone. The late 1910s and early 1920s were marked by an economic depression that unraveled in particularly catastrophic circumstances: The Great War and its aftermath led to a global nosedive in commodities that ruined many developing nations, while servicemen returning from the trenches found themselves with high unemployment as businesses failed, unable to transition into a peacetime economy. Also, the Spanish flu pandemic of 1918-20 brought economic activity to a standstill as even more people became incapacitated. Most developed countries had mostly recovered by 1921-22, however Germany saw its economy crippled until 1923-24 because of the hyperinflation crisis. The 1973 oil crisis, coupled with the rising costs of maintenance of welfare state in most countries led to a recession between 1973 and 1975, followed by a period of almost minimal growth and rising inflation and unemployment. The 1980-82 recession marked the end of the period. The savings & loans and the leveraged buyout crises led to a severe depression in mid-to-late 1989, causing a recession in 1990-91 (also fueled by the oil price crisis), whose effects lasted as late as 1994. This downturn is more remembered for its political effects: British Prime Minister Margaret Thatcher had to resign in November 1990 as a result of the socioeconomic debacle caused by her later policies; and while his approval ratings were above 60%, U.S. President George H. W. Bush lost the 1992 election to Bill Clinton because of the domestic malady marked by the depression and increasing urban decay. In 2005, the persistent oil price rises and economic overheating caused by deregulation led to a gradual deterioration of the world economy with inflation and unemployment rising as growth slowed down: The housing bubble in the U.S. burst in 2007, and the American economy slipped into a recession. This in turn provoked the failure of many prominent financial institutions throughout 2008, most notably Lehman Brothers, leading to the loss of millions of jobs. Several Latin American countries had severe downturns in the 1980s: by the Kehoe and Prescott definition of a great depression as at least one year with output 20% below trend, Argentina, Brazil, Chile, and Mexico experienced great depressions in the 1980s, and Argentina experienced another in 1998–2002. South American countries fell once again into this in the early-to-mid 2010s as a result of falling prices of commodities such as in the 1980s, with the economies of Argentina, Brazil and Venezuela falling into recession as massive government spending further strained their financial situation. This definition also includes the economic performance of New Zealand from 1974–1992 and Switzerland from 1973 to the present, although this designation for Switzerland has been controversial. Over the period 1980–2000, Sub-Saharan Africa broadly suffered a fall in absolute income levels. The economic crisis in the 1990s that struck former members of the Soviet Union was almost twice as intense as the Great Depression in the countries of Western Europe and the United States in the 1930s. Average standards of living registered a catastrophic fall in the early 1990s in many parts of the former Eastern Bloc, most notably in post-Soviet states. Even before Russia's financial crisis of 1998, Russia's GDP was half of what it had been in the early 1990s. Some populations are still poorer today than they were in 1989 (e.g. Ukraine, Moldova, Serbia, Central Asia, Caucasus). The collapse of the Soviet planned economy and the transition to market economy resulted in catastrophic declines in GDP of about 45% during the 1990–1996 period and poverty in the region had increased more than tenfold. Finnish economists refer to the Finnish economic decline around the breakup of the Soviet Union (1989–1994) as a great depression (suuri lama). However, the depression was multicausal, with its severity compounded by a coincidence of multiple sudden external shocks, including loss of Soviet trade, the savings and loan crisis and early 1990s recession in the West, with the internal overheating that had been brewing throughout the 1980s. Liberalization had resulted in the so-called "casino economy". Persistent structural and monetary policy problems had not been solved, leaving the economy vulnerable to even mild external shocks. The depression had lasting effects: the Finnish markka was floated and was eventually replaced by the euro in 1999, ending decades of government control of the economy, but also high, persistent unemployment. Employment has never returned even close to pre-crisis level. ^ a b "The NBER's Business Cycle Dating Procedure: Frequently Asked Questions". Nber.org. Archived from the original on 2012-10-08. Retrieved 2012-09-07. ^ "Private Tutor". Infoplease.com. Archived from the original on 2012-09-13. Retrieved 2012-09-07. ^ "Diagnosing depression". The Economist. December 30, 2008. Archived from the original on February 15, 2009. ^ "Home Improvement Tips and Techniques | Business Cycles". Archived from the original on 2009-02-02. Retrieved 2009-04-15. ^ a b c "When Did the Great Depression Receive Its Name? (And Who Named It?)". hnn.us. Archived from the original on 1 September 2013. Retrieved 9 May 2018. ^ Tilley,Edward (December 21, 2018). End of War - Managing Mature Capitalisms. Dashflows Book Group. ^ Rezneck, Samuel (1935-07-01). "The Social History of an American Depression, 1837-1843". The American Historical Review. The American Historical Review. 40 (4): 662–687. doi:10.2307/1842418. JSTOR 1842418. ^ a b "Panic of 1837 (1837 - 1842) — History of Economic Recessions". Politonomist.com. 2009-01-02. Archived from the original on 2009-04-06. Retrieved 2012-09-07. ^ "About the Great Depression". English.uiuc.edu. Archived from the original on 2008-12-20. Retrieved 2012-09-07. ^ "Greece sinks deeper into depression in third quarter". Reuters. 2012-11-14. Archived from the original on 2012-11-14. Retrieved 2012-11-14. ^ Abrahamsen Y, R.; Aeppli, E.; Atukeren, M.; Graff, C.; Müller; Schips, B. (2005). "The Swiss disease: Facts and artifacts. A reply to Kehoe and Prescott". Review of Economic Dynamics. 8 (3): 749–758. doi:10.1016/j.red.2004.06.003. ^ Kehoe, T. J.; Ruhl, K. J. (2005). "Is Switzerland in a Great Depression?". 8. Review of Economic Dynamics: 759–775. ^ Chang, Ha-Joon. "Kicking Away the Ladder: How the Economic and Intellectual Histories of Capitalism Have Been Re-Written to Justify Neo-Liberal Capitalism" Archived 2015-12-17 at the Wayback Machine. Post-Autistic Economics Review. 4 September 2002: Issue 15, Article 3. Retrieved on 8 October 2008. ^ "What Can Transition Economies Learn from the First Ten Years? A New World Bank Report in Transition Newsletter". Worldbank.org. ^ "Kalikova & Associates - Law Firm" (in Russian). K-a.kg. Archived from the original on 2012-09-07. Retrieved 2012-09-07.